When the world is overcome with The Great Blight of poverty, corruption, and hopelessness, a group of young wizards seizes control and makes sweeping changes – which divides the human race into loyal supporters of the new regime, and bitter, angry revolutionaries. In the midst of the turmoil is Amanda Fullerton, a grad student who is hired to act as liaison between the wizard council in North America and its citizens. While ruling like monarchs from their perch in the sky, the self-proclaimed "Liberators" create a widening gap among the Mortals, with Amanda caught in the middle. As Amanda tries to serve both sides, she becomes embroiled in the twisted agendas of these puppet masters. With alluring, yet deadly wizard games that threaten her life and romantic entanglements, Amanda discovers her "dream job" is anything but! While the four wizards – Demus, Indie, Regi, and Justica initially unite under their libertarian ideals and their revered god Elsedor, their unique personalities eventually lead to infighting, with the fate of the continent up for grabs. "The Four Kings" casts a spell on its readers with a well-woven tale of fantasy, thriller, romance, and political intrigue that will keep you guessing until the end – and perhaps beyond. 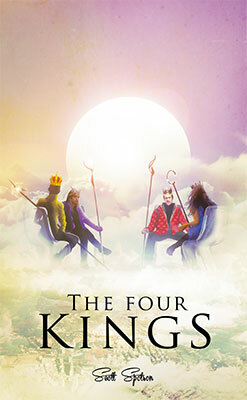 I was really pleased when the Sci-Fi and Fantasy eBook Club on Goodreads voted for The Four Kings as the Fantasy reading for May 2014. Scott Spotson already self-published a number of well-rated Fantasy novels including Life II and Seeking Dr. Magic, so I was quite excited: I got the eBook from SmashWords and finished it in a couple of days. If I had rated this book upon the number of fun ideas it shows off, it would have been a full five: Scott Spotson’s imagination pops out in every page of this novel, making it absolutely entertaining. On the other hand, I was confounded by the immaturity of the protagonists and this is really where the book lost points for me. Listen, how do his neighbors feel about spending their own money, for which they have to feed their families, upon taxes—taxes that are arbitrarily seized by government? This family paying for an evil which is no fault of their own? But try telling the public that they should contribute their valuable bitcoins to a government employee who examines effluent levels for raw sewage emitted by major factories. They just don’t know about valuable roles like that. The book brings to light some embarrassing contradictions between the ideal of freedom and the need for rules and regulation. But I wish these issues had been explored in more details: too often the discussion is cut short. Some other problems mentioned earlier are later solved with no further explanation, such as the (re)employment of millions of government workers. I found this frustrating. On another aspect, I really enjoyed how wizardry fits in The Four Kings‘ world. In this novel, wizardry is believed to be a sort of recessive genetic trait. Consequently wizards are born to ordinary human parents. This leads to a few moving chapters about the childhood and coming of age of wizards in a world where everyone must fit in. The magic system is also very original: it focuses on games and especially puzzles. I didn’t particularly enjoy the Wizard Games — they looked pretty primitive — but I did love the puzzle-based magic system. You can lift a charm by solving its underlying puzzle. This is a really neat concept! So really, The Four Kings is entertaining. There is a lot going on and Scott Spotson’s imagination is impressive. But on the other hand, I sincerely couldn’t stand the immaturity of the characters. My image? What’s wrong with my image? I’m a powerful wizard. I have a fan club! They are vain, childish and condescending. They constantly behave like spoiled children less than half their actual age. It was extremely annoying. The love story was another massive eye-roller. It is so cheesy that the words are almost melting on the page when you read them! It is all very sudden and superficial and could certainly do with a touch of subtlety. [He] was what her girlfriends referred to as “the total package”—hot, sweet, smart, and available. And speaking about lack of subtlety, here is the last big problem for me in The Four Kings: Amanda’s spying skills are utterly ridiculous! She flatters her targets in the most blatant way and they don’t get suspicious. She asks questions she shouldn’t right after the flattering, and they still don’t see anything wrong. Really?! “Mmm-hmm,” said Regi, his eyes still closed. He conveyed no expression except satisfaction. Keep talking. “I’m just wondering, how did they pick you? How does it work? So, this is how it decided on only 3 out of 5. I had a very nice time reading about The Four Kings world, the wizardry system, the social issues it implies and the speculations about what if we just suddenly threw over our old political and economic system. But there was a strange gap between the seriousness of the subject and the childish behaviour of the characters. Besides, I wish some issues had been explored in more details instead of skipping through them.